15 x 15 in. 15 x 18 in. 18 x 20 in. 12 x 13 in. 18 x 18 in. 13 x 15 in. 18 x 15 in. 15 x 16 in. 20 x 16 in. 16 x 18 in. 13 x 16 in. 18 x 16 in. 20 x 20 in. 16 x 16 in. 20 x 18 in. 16 x 15 in. 12 x 12 in. Each and every user will benefit from a customized fit through the simple push of a knob. The revolutionary ISOFLO Memory Control offers shape fitting capabilities while the user is seated, allowing quick and easy on-demand adjustment to maximize function. With the built -in stability and simplicity of the QUADTRO SELECT Cushion, no longer will you have to sacrifice maximum skin protection to get stability, positioning or convenience. The Quadtro Select Cushion does it all! Lightweight: Easy to handle and carry, at just 4.6 lbs./2 kg. in facilitating blood flow by fitting, matching and tracking the shape of a person. 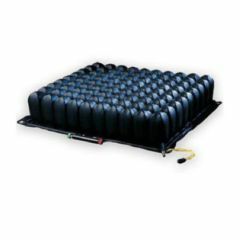 The Quadtro Select Cushion offers a new level of stability never before found in an air floatation cushion. Stability is enhanced by locking the air into place in each of the four quadrants through the simple use of the ISOFLO Memory Control, minimizing side to side or front to back motion. QS88C - 15 x 15 in. QS810C - 15 x 18 in. QS1011C - 18 x 20 in. QS67C - 12 x 13 in. QS1010C - 18 x 18 in. QS78C - 13 x 15 in. QS108C - 18 x 15 in. QS89C - 15 x 16 in. QS119C - 20 x 16 in. QS910C - 16 x 18 in. QS79C - 13 x 16 in. QS109C - 18 x 16 in. QS1111C - 20 x 20 in. QS99C - 16 x 16 in. QS1110C - 20 x 18 in. QS98C - 16 x 15 in. QS66C - 12 x 12 in. Comfortable. Solid Construction. Multiple Positions. Easy to Control. Attractive Design. great only cushion i buy. Easy to Control. Comfortable. Solid Construction. Multiple Positions. Pressure sores would not have healed without this cushion. Should have had it before sores started. Best wheelchair cushion for someone who cannot move. I'm a new paraplegic. I was provided one of these cushions by my powerchair provider when my wound care doctor prescribed a custom chair to combat severe decubitus ulcers prior to undergoing flap surgery to close the worst of them. When they did a pressure mapping on my old chair, it had large red areas indicating dangerous pressure. When we repeated the mapping with the new cushion all of the red areas were gone, replaced by a few small areas of light blue that totally disappeared by slightly adjusting the tilt of the chair. This cushion will allow me to return to my normal day job as a computer programmer where I have to spend at least 8 hours a day sitting in my chair. I'am looking for a cushion to take pressure off certain areas. is this the right one? i have a area i want to take pressure off. and keep regular pressure on the other area. Is this the best type of cushion for a lift chair? can this be used in a wheelchair or recliner? Yes I first encountered these being used in the driver's seat by some long haul truckers. I bought one for my wheelchair when I became paraplegic 4 years ago. You will probably want a cover. Oh yeah, if you have cats you'll need to keep them off! I think this is the best for wheelchair use. Prevents pressure sores. My son has been using this for 5 years.